Inspired by my most recent visit to Sammy’s Roumanian and, posthumously, by a dinner at the now defunct Kutsher’s Tribeca, I decided to try my hand at the Romanian tenderloin — that intriguing dish that’s neither really Romanian (do you know how they call a restaurant that serves properly cooked steaks in Romania? An American steakhouse), nor a tenderloin (it’s skirt steak). I figured I’d push the concept into two opposing directions at once: why not make a Roumanian steak that’s not even a steak, but eats like a steak, and that’s actually Romanian yet still Jewish at the same time? Don’t get me wrong, I love skirt steak. But if you must turn a less tender cut of meat into filet mignon through some kind of meat alchemy, I think brisket is a better candidate. The thick, fatty beef breast has the potential to yield beautiful slices of steaky goodness. Now, you don’t just throw it in a hot pan and cook it. Turning it into a steak-like cut requires some precise handling to tenderize it, which is only marginally compatible with the doneness we’re trying to achieve. Beef’s target internal temperature is 49-54 C / 120-130 F for rare, and 54-57 C / 130-135 F for medium rare. Meanwhile, collagen denaturation, the chemical process that will make the meat tender, starts around 52 C / 126 F, and accelerates at higher temperatures. I’ve experimented with various sous-vide cooking parameters, and got a damn near perfect result at the 54 C / 130 F mark, after a lengthy 72 hours. There may be room for more tiny tweaks (try 53.5 C, 54. C, 48 hours, 96 hours…), but I’m pretty happy with these settings (and I’m running out of brisket). 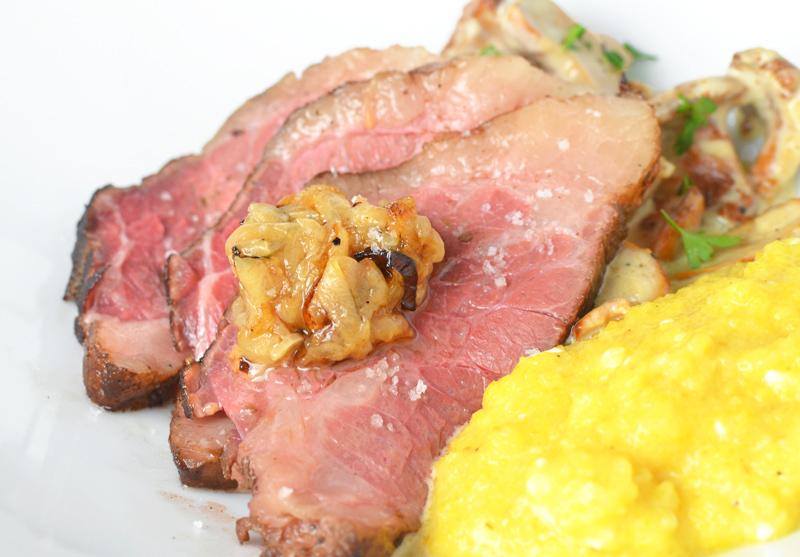 The meat comes out extremely tender and buttery, and still medium rare. Brisket is also more Jewish than skirt steak. Ever heard of New York pastrami? It’s made with the flat half of the brisket. As for the Romanian cred, well, pastrami was actually introduced in the United States by Romanian Jews in the second half of the 19th century. While goose breast was the meat of choice back in the motherland, beef brisket proved more practical (read: cheaper) in America. Could my Romanian steak be more Jewish and more Romanian than Sammy’s? 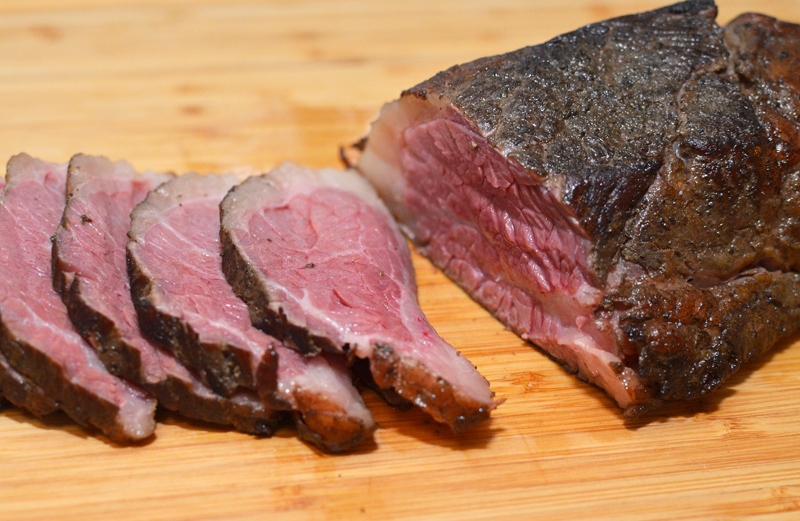 Beef brisket isn’t hard to find, but you should know that there are really two parts in a brisket. There’s the flat half, aka first cut, aka lean brisket at your BBQ joint, which is the leanest part with little intramuscular fat (though possibly plenty of fat around it). It’s the part that’s used for pastrami. It can be delicious when prepared right, but if it’s overcooked it easily becomes dry. Then there’s the point half, aka second cut, aka deckle, aka moist or fat brisket in BBQ parlance, which is much more marbled, and almost always feels moister. Watch NYT food writer Melissa Clark’s explanations on video here (just ignore her use of the term deckle, which is slightly controversial). While you could use either half of the brisket for this recipe, since one seeks good marbilization in a real steak, I would recommend using the point half. There are also different grades of beef (Prime, Choice, and Select), and they do matter — barbecue enthusiasts, read this. Switch to the Japanese system, and there are even more grades that are off the US chart! I bought my brisket from Snake River Farms. Treat yourself to one of their whole wagyu briskets for perfectly marbled meat, whose grade is roughly equivalent to USDA Prime for the regular wagyu, and exceeds it for the “Gold Grade” wagyu. Be aware that there is such a thing as too much fat, unless you plan to eat your meat on a slice of bread, like the beef butter at M. Wells Steakhouse. Some of this is also a matter of personal preference. To reinforce the Romanian foundation, I have two very Romanian garnishes: polenta and chanterelle stew. In the past, I’ve tended to see polenta as an insipid starchy gooey mass that is either consumed as mere nourishment, or used as a vehicle for other ingredients and flavors. That all changed when I tried the recipe from Modernist Cuisine at Home. Finally, here was a polenta that actually tasted like corn, with all its sweetness, and it was actually simple to make! My recipe is a modified version. The chanterelle stew is called Tocăniță de gălbiori in Romanian. It’s nothing complicated, but it pairs wonderfully with both the corn and the beef. Finally, getting back to the Jewish side of the dish, I’m serving it with chicken liver mousse as an homage to Sammy’s chopped liver appetizer (and because it goes well with the rest!). 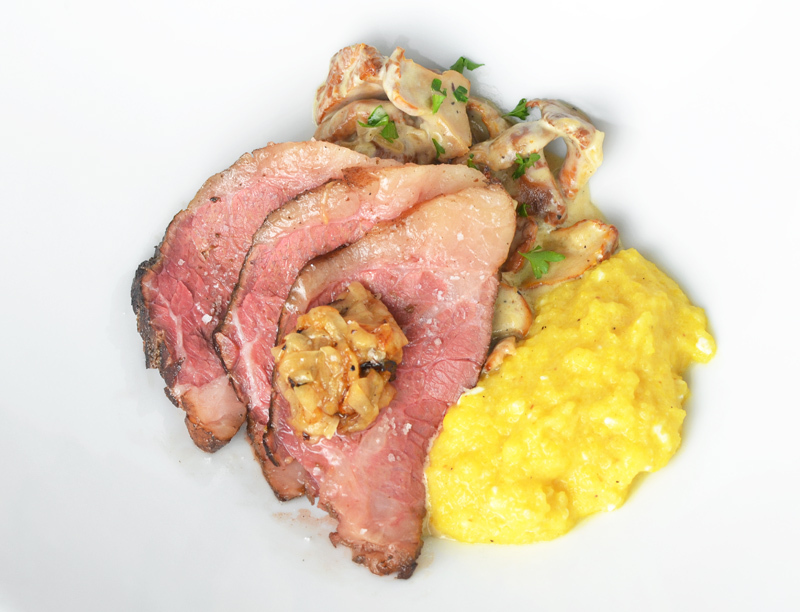 The recipe is adapted from the material in Chef Steps’ “Cooking Sous-Vide: Beyond the Basics” online class. Among other things, I replaced the bacon with schmaltz. 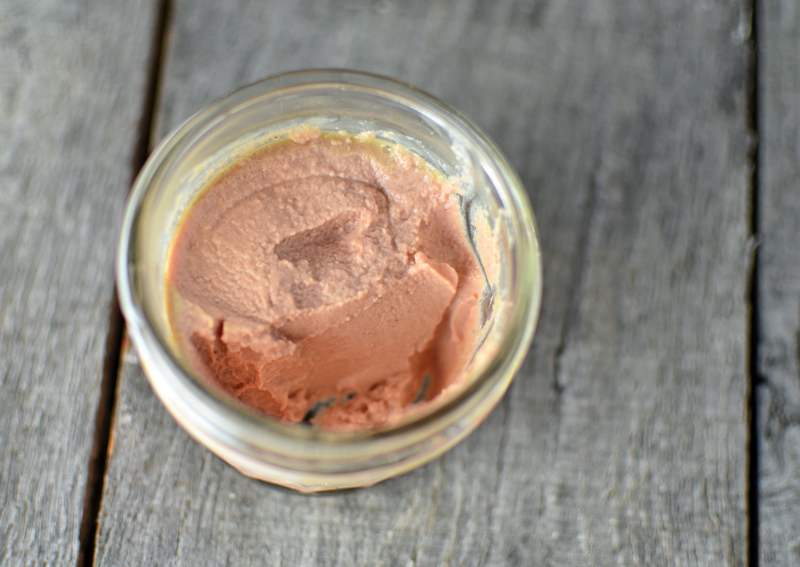 The delicious mousse, which manages to make chicken liver more approachable, can be made in advance and kept in the refrigerator for about 1 week. It tastes even better after a couple days, once the flavors have had some time to blend. In a pan over medium heat, sauté the onions and shallots in the schmaltz until soft. Mix in the star anise, and cook for 30 seconds. Add the dessert wine and plum brandy to the pan, bring to a boil, and cook for about one minute, stirring occasionally. Turn off the heat, and let rest for about 10 minutes to infuse the flavors. Strain the reduction through a chinois. Using a spatula, press down to extract as much liquid as possible. You should end up with about 60-65 g of liquid. In a blender, combine the liquid with the chicken livers, egg white, egg yolk, salt, pink salt, black pepper, and vanilla extract. Blend on medium-high speed until just smooth. While blending on low speed, slowly add the butter. Pass the purée through a chinois, and transfer to three sterilized 4 fl. oz (about 120 ml) Mason jars. Tightly close the lids, place the jars in a 68 C / 154 F water bath, and cook for 90 minutes. Transfer to an ice bath, chill completely, then refrigerate. The mousse can be kept for a week. Before serving, open the jars and scrape away the thin beige layer that may have formed on top. Season the beef brisket on all sides with the smoked salt, regular salt, and black pepper. Depending on your personal preference, you can change the breakdown between smoked salt and regular salt, as long as the total amount of salt represents 1% of the weight of the brisket. In a pan over high heat, sauté the brisket with the fatty side down first, then flip and cook until brown on all sides. Transfer to a sous-vide pouch, vacuum-seal, and cook in a 54.5 C / 130 F for 72 hours. Keep the brisket at that temperature until serving. 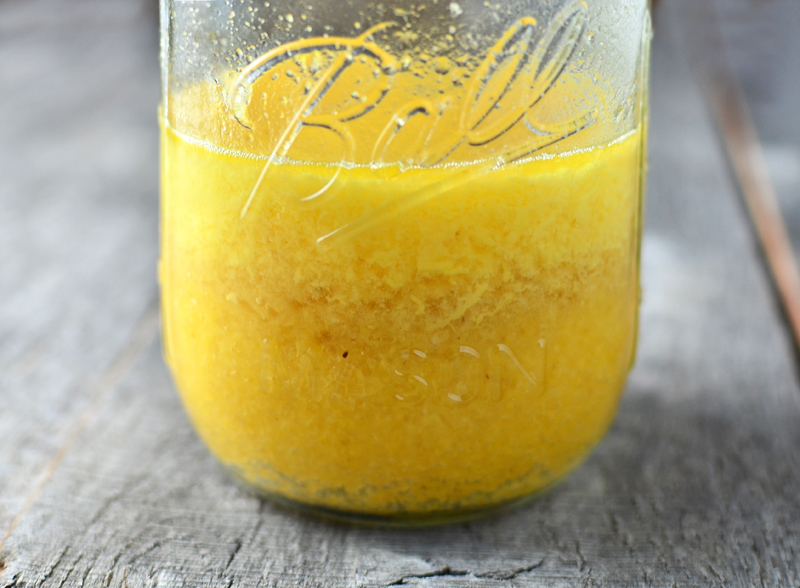 Transfer the polenta to two pint (about 500 ml) Mason jars. Cover with the corn juice and water, and mix with a fork. Tightly close the jars, then reopen the lids by just a quarter of a turn. Place the jars on a steam rack in a pressure cooker and add about 1 cm of water. Close the cooker, bring to pressure, and cook for 12 minutes. Depressurize the pressure cooker and take out the jars. Reserve. Before serving, mix in the feta, and season with salt and pepper. In a saucepan over medium heat, sauté the onion and garlic in half of the olive oil until golden brown. Add the rest of the oil and the chanterelles, season with salt and pepper, and cook until soft. Add the milk, bring to a boil, then simmer over low heat for 10 minutes. Add the heavy cream, and simmer for another 5 minutes. Cover and reserve. Slice the shallots very thinly, preferably with a mandoline. Place the shallots, vinegar, water, sugar, and salt into a small saucepan. Cook over low heat for 5 minutes, then let cool. Drain the shallots before serving. Drizzle the baguette with olive oil, and toast in a 200 C / 400 F oven until golden brown. Let cool. 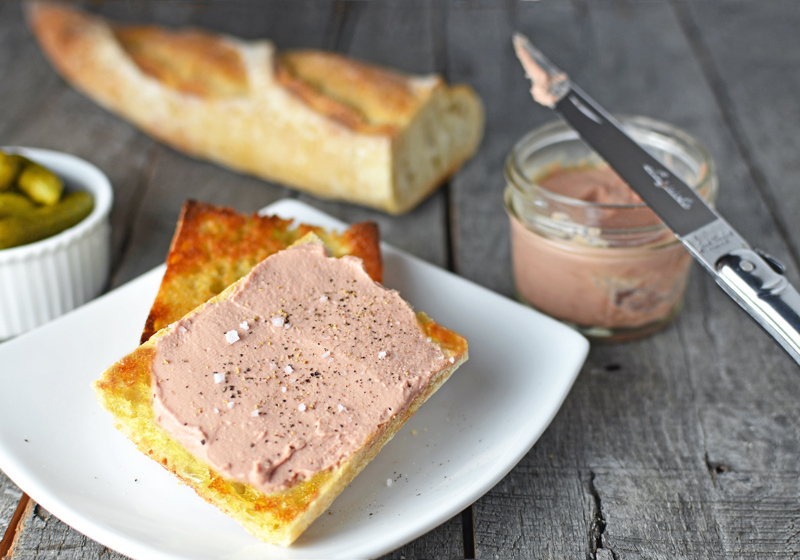 Spread some chicken liver mousse on each slice of bread, and top with a few pickled shallots. Optionally, sprinkle with pepper and fleur de sel to taste. Reserve. Reheat the polenta in a saucepan over low heat. Reheat the chanterelle stew in a saucepan over low heat, then sprinkle with chopped parsley. Take the brisket out of its sous-vide pouch, reserving the cooking liquid. In a pan over high heat, sauté the meat in canola oil until dark brown on all sides. Remove from the pan, and let rest for a couple minutes. In the same pan, sauté the onions and garlic until golden brown, and season with salt. Reserve. Slice the brisket, pour some of the cooking liquid on the slices, and sprinkle with fleur de sel. In each bowl, arrange a small mound of chanterelle stew next to a couple spoonfuls of polenta. Fan out a few slices of brisket, topped with a little bit of the sautéed onions and garlic. Serve with the chicken liver mousse toasts on the side.